Punjab is the most cultivated state in India with the highest consumption of fertilizers. Patiala and Muktsar districts are two agricultural dominated districts of Punjab located in extreme south-east and south-west of the state. This paper highlights temporal variations of the groundwater quality and compares its suitability for irrigation and drinking purpose in these two districts. Water samples were collected in March and September 2003, representing the pre-monsoon and post-monsoon seasons, respectively. Water samples were analysed for almost all major cations, anions, dissolved heavy metals and turbidity. Parameters like sodium adsorption ratio, % sodium, residual sodium carbonate, total hardness, potential salinity, Kelley’s ratio, magnesium ratio, index of base exchange and permeability index were calculated on the basis of chemical data. A questionnaire was also used to investigate perception of villagers on taste and odour. Comparison of the concentration of the chemical constituents with WHO (world health organization) drinking water standards of 2004 and various classifications show that present status of groundwater in Patiala is better for irrigation and drinking purposes except for a few locations with a caution that it may deteriorate in near future. In Muktsar, groundwater is not suitable for drinking. Higher total hardness (TH) and total dissolved solids at numerous places indicate the unsuitability of groundwater for drinking and irrigation. Results obtained in this forms baseline data for the utility of groundwater. 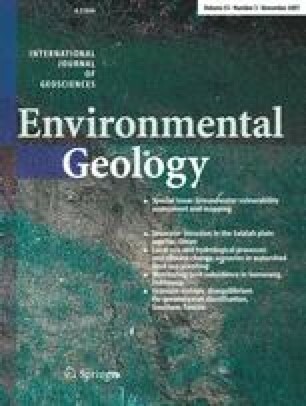 In terms of monsoon impact, Patiala groundwater shows dilution and flushing but Muktsar samples show excessive leaching of different chemical components into the groundwater leading to the enrichment of different anions and cations indicating pollution from extraneous sources. No clear correlation between the quality parameters studied here and perceived quality in terms of satisfactory taste response were obtained at electrical conductivity values higher than the threshold minimum acceptable value. Author (MK) thanks Council of Scientific and Industrial Research (CSIR) India for financial grant through a junior research fellowship. The authors also acknowledge the Department of Science and Technology (DST) and TIFAC-ITSAP, Govt. of India for partial funding. First author also like to thank Ms. Rita Chauhan, for her able contribution in map preparation. At last we would like to thank anonymous reviewer and Dr. Roger Herbert Jr. for their useful comments.